That was the extent of the information NOLA.com provided its readers. No transcript, much less a story, accompanied the video, which suffered from an already agitating media player and apparently did not work on mobile devices. Instead, word of the specific firings was left for other media sources to uncover. Most of the work was done by the Gambit, a New Orleans alternative print weekly that stands to gain advertising dollars from the T-P’s cutbacks but has championed the city’s protests nevertheless. NOLA.com began to release some of the more notable names that were laid off by Tuesday afternoon. The Gambit reported that at least one of those names, sports columnist Peter Finney, was at home writing a column when the news was published. Nobody had told him he was among the casualties. The print newspapers brought readers up to speed Wednesday morning. Poynter Director Julie Moos compared the presentations of the news, complete with images of each paper’s front page. The Times-Picayune coverage was upfront and uncomfortable. In other words, just what it should have been. 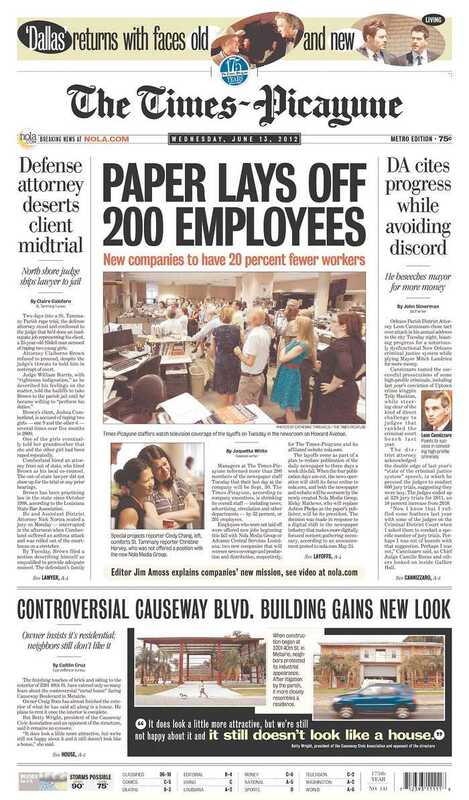 The headline, “Paper lays off 200 employees,” is prominent and gets straight to the point. The story includes large, color pictures from inside the newsroom and a wealth of department-by-department information. NOLA.com featured the headline in a banner in between the site’s navigation and the “front page” story. We knew the pain was coming. We knew the layoffs would be huge. Economically, they had to be. The connection between the Times-Picayune and its readers – they weathered Katrina together – demanded honest coverage. By and large, that community received it. 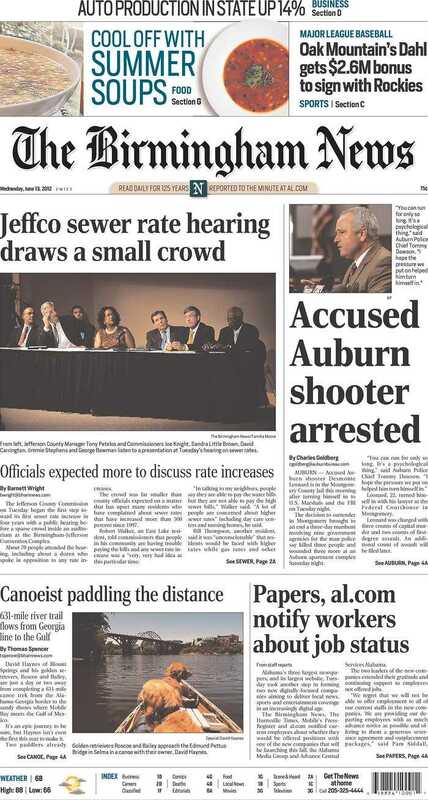 But in Alabama, where the backlash has not been as severe, Advance Publications showed the world exactly how they envision the new age of newspapers to operate… transparency buried deep within a convoluted, ineffective website, muted by headlines that reassure us everything is okay. If a media group can’t effectively and honestly cover itself, what faith should the citizens have in their watchdog?